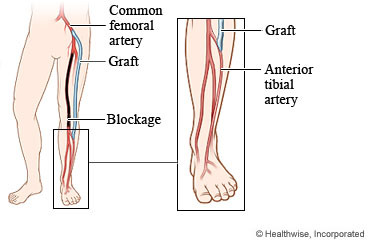 Femoral-tibial bypass is surgery to bypass diseased blood vessels in the lower leg or foot. You will probably need to take 2 to 6 weeks off from work. It depends on the type of work you do and how you feel. You may shower, if your doctor okays it. Do not take a bath for the first 2 weeks, or until your doctor tells you it is okay. Your doctor may prescribe a blood thinner, such as aspirin, when you go home. This helps prevent blood clots. Wash the area daily with water, and pat it dry. Don't use hydrogen peroxide or alcohol, which can slow healing. You may cover the area with a gauze bandage if it weeps or rubs against clothing. Change the bandage every day. Prop up your leg on a pillow anytime you sit or lie down during the next 3 days. Try to keep it above the level of your heart. This will help reduce swelling. Enter H742 in the search box to learn more about "Femoral-Tibial Bypass Surgery: What to Expect at Home".